A specially painted, co-branded Alaska Airlines and Virgin America 737-900ER aircraft, painted in shimmering red, purple and blue and featuring the slogan “More to love,” lands at San Francisco International Airport on December 14, 2016 in San Francisco, CA. The newly painted aircraft is part of the merger celebration of Alaska Airlines and Virgin America. 4 p.m., Dec. 14, 2016 update: Photos and b-roll of the Dec. 14 press conference in San Francisco are available for download at the bottom of this post. Bacon on a donut. Electricity and guitars. Labradors and poodles. Men in Black’s Agent J and Agent K.
Today Alaska Airlines and Virgin America officially joined forces and are now the latest odd couple that, as Alaska Air Group CEO Brad Tilden said today, is on the verge of greatness. While the two companies may seem very different on the surface, Tilden says there’s more in common than you’d think, and together they’ll keep challenging the status quo to make flying better for everyone. Airline consolidation over the past decade has led to the big four airlines controlling more than 80 percent of the market, making it harder for smaller, lower fare airlines like Alaska and Virgin America to grow. “We’re here to shake things up by joining forces with an airline that has been disrupting the industry since it started flying in 2007,” says Tilden. Separately, the two companies are strong. They each consistently win awards for customer service and performance, and are known for their low fares, innovative approaches and caring employees. For the past couple years, Alaska and Virgin America have been ranked No. 1 and No. 2 in the Wall Street Journal’s annual airline scorecard. Today Alaska and Virgin America have an expanded route network with nearly 1,200 daily flights to 118 destinations across North America, Costa Rica and Cuba. Today Alaska also announced new flying from San Francisco to Minneapolis, Orlando and Orange County. With a combined network taking West Coast customers to the top destinations they want to fly, and backed by an award-winning frequent flier program, Tilden says together Alaska and Virgin America are poised to do great things for customers. That means more choices and lower fares, more rewards, and more to love. Today, the combined airlines offer customers a bigger network, more flights and more rewards. In the eight months since Alaska and Virgin America agreed to merge, employees of both airlines have shared countless stories on Facebook, Instagram and Twitter about meeting and welcoming their future colleagues. Both airlines are leaders in customer service. Alaska has received top marks for its customer satisfaction scores for nine years and counting, while Virgin America regularly receives top accolades in rankings of best domestic airlines. And according to Tilden, it’s only getting better from here. “Our employees are the proof of what we suspected: that together we’re stronger than apart. Think about all those famous odd couples whose differences made them stronger – and allowed them to change the world,” says Tilden. The Virgin America ticket counter is decorated to celebrate the closing of its merger with Alaska Airlines merger at San Francisco International Airport on Dec. 14, 2016. Alaska Airlines President and COO and Virgin America CEO Ben Minicucci, right, greets a Virgin America teammate at San Francisco International Airport on Dec. 14, 2016. A specially painted, co-branded 737-900ER, painted in shimmering red, purple and blue and featuring the slogan ÒMore to love,Ó is parked at the gate at San Francisco International Airport on Dec. 14, 2016. Alaska Airlines and Virgin America employees celebrate the airlines merger at San Francisco International Airport on Dec. 14, 2016. 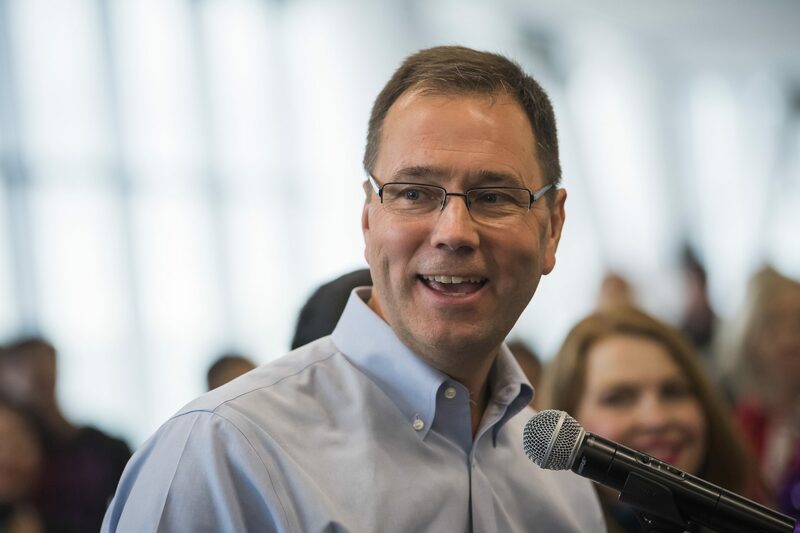 Alaska Airlines CEO Brad Tilden speaks to Alaska Airlines employees, Virgin America teammates, and members of the media during a press conference at San Francisco International Airport on Dec. 14, 2016. Alaska Airlines and Virgin America employees wear commemorative t-shirts celebrating the merger at San Francisco International Airport on Dec. 14, 2016. Alaska Airlines President and COO and Virgin America CEO Ben Minicucci stands in front of a specially painted, co-branded 737-900ER at San Francisco International Airport on Dec. 14, 2016. Alaska Airlines President and COO and Virgin America CEO Ben Minicucci speaks to Alaska Airlines employees, Virgin America teammates, and members of the media during a press conference at San Francisco International Airport on Dec. 14, 2016. San Francisco International Airport Director Ivor Satero speaks to Alaska Airlines employees and Virgin America teammates at a press conference at the airport on Dec. 14, 2016. Alaska Air Group CEO Brad Tilden, left, and Alaska Airlines President and COO and Virgin America CEO Ben Minicucci, right, greet a Virgin America teammate at San Francisco International Airport on Dec. 14, 2016. Alaska Air Group CEO Brad Tilden, left, and Alaska Airlines President and COO and Virgin America CEO Ben Minicucci, right, greet Virgin America teammates at San Francisco International Airport on Dec. 14, 2016. Alaska Air Group CEO Brad Tilden, left, greets an Alaska Airline teammate at San Francisco International Airport on Dec. 14, 2016. Alaska Air Group CEO Brad Tilden, left, greets Virgin America teammates at San Francisco International Airport on Dec. 14, 2016. San Francisco Mayor Ed Lee speaks to Alaska Airlines employees and Virgin America teammates at a press conference at San Francisco International Airport on Dec. 14, 2016. Alaska and Virgin America teammates celebrate the completion of their two companiesÕ merger at San Francisco International Airport on Dec. 14, 2016. An Alaska Airlines 737-900ER, a Virgin America Airbus A320 and a specially painted, co-branded 737-900ER arrive at San Francisco International Airport on Dec. 14, 2016. Alaska Airlines pilots Brian Holm, left, and John Ladner celebrate the Alaska Airlines Virgin America merger upon arriving at San Francisco International Airport on Dec. 14, 2016. Alaska employees and Virgin America teammates celebrate the completion of their two companiesÕ merger at San Francisco International Airport on Dec. 14, 2016. 5 comments on "Different works: uniting two airlines to create one great flight experience"
It is my hope the high quality, the excellent service, and the on-time flights will remain the priorities of the new combined Alaska-Virgin America Airline. It is also my hope the Alaska Airlines Tail of the Alaskan man will also remain as a reflection of the strong, committed, and dedicated staff of the Alaskan roots of the combined airlines. Glad to join you in celebrating this change. You fly everywhere I want to go. Thank you for making traveling a breeze. So proud of the news today ! Looking forward to all the new places I can travel with the Alaska MIleage Plan. Alaska Air Group has talented leaders.